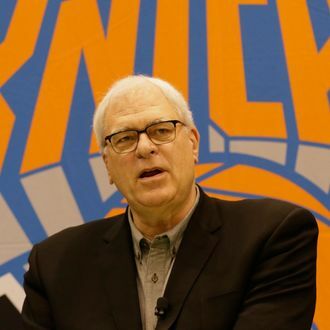 The Knicks need a head coach, and the New York media have been obsessing over whom team president Phil Jackson should hire to finally turn the team into a consistent winner. Could David Blatt be the guy? Or Mark Jackson? Might they just give the job to interim coach Kurt Rambis? Why isn’t Brian Shaw being considered? And now even Frank Vogel, who reached a couple of conference finals in Indiana, is available. But while the speculation grows and the situation becomes more urgent as other teams look to fill their own coaching vacancies, Jackson is … elsewhere. He reportedly left town over the weekend, and on Tuesday, he tweeted a picture of a Thai restaurant in Sioux City, Iowa. Jackson’s brother told a TV station that he’d been visiting Phil in New York, and that the Knicks president is taking him home to Idaho. Jackson reportedly is then heading to Montana, where he has a ranch at Flathead Lake. As the Kings and Rockets continue their coaching searches (and the Pacers get set to start their own), Knicks fans are anxious about the team’s future, and the local press has everything Jackson does (or doesn’t do) during the process under a microscope. There can’t be much doubt about that.